Continuing the quest for clues about each child’s creative strengths, I present these activities for three more elements of the Sensory Alphabet. Demonstrate turning around once and posing like a statue. Encourage children to make their own unique poses. Videotape several children doing so at the same time. 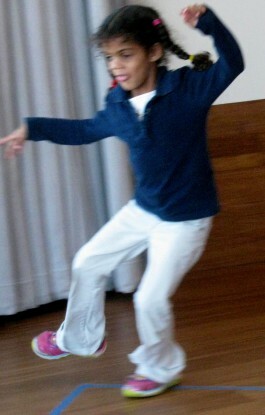 A child strong in body movement will show control in turning around and will create an interesting pose. May not follow directions in one way or another, which may indicate a lack of interest in movement. May show a lack of control, be unable to stop moving, or act very silly, indicating they may have a strength in movement but it is difficult to ascertain from their actions. Use chalk or tape to create a line in the middle of the room. Ask children to show an interesting way to get from one side of the line to the other. Videotape or photograph each one. A child with a movement strength will do something that shows control/skill and imagination. 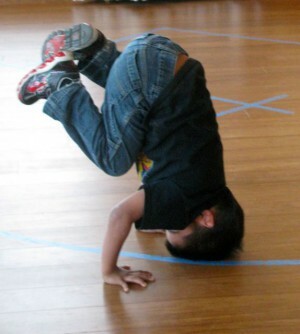 Examples: turn a cartwheel, broad jump, leap, dance, gallop, somersault, tiptoe backward, spin on their head, etc. Some may simply step over the line, which may indicate a lack of interest in movement. Some children may take a long time to think of something, which also may indicate little imagination in movement. 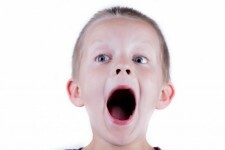 Give each child about 5 seconds to make as many animal sounds as they can (with voice/body). Record each one and notate their names just before they make the sounds. A child with a strength in sound will probably produce many sounds and/or the sounds will seem fairly realistic. Some children may take a long time to think of what to do or may make few (or no) sounds, indicating they may not have an interest in this area. Some children may say words like “Moo!” that sound like words more than sounds, indicating they may have strengths in other elements. Prepare four (real) glasses with different amounts of water. 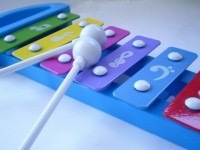 Alternatively provide a xylophone or other instrument with only 4 pitches. 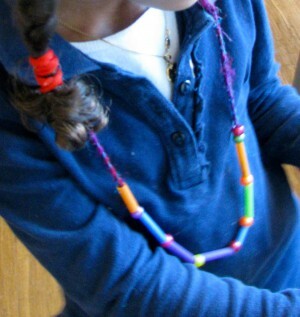 Show the children how to strike the glasses with a pencil to make sounds. This child with a sound strength will create a pleasant or interesting melody. Some may make random sounds or make a minimal tune, showing little interest in sound. Some may create a rhythmic beat, indicating more interest in rhythm. Clap a steady rhythm and ask the children to join in. 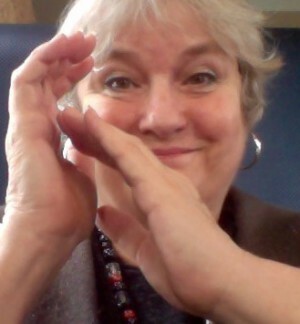 Creates a simple clapping rhythm (with 2-6 beats) and ask the children to echo after each one. Ask the children to take turns clapping their own rhythms (or beating them on a drum or with another percussion instrument.) If possible video each child and stop them after 25-30 seconds. If you audiotape them instead be sure to say each child’s name before they begin. A child with an aural rhythm strength can easily perform all the tasks. Some children may be able to keep or repeat a beat but not generate a steady or interesting beat on their own. Some children may not be able to keep or repeat a beat. 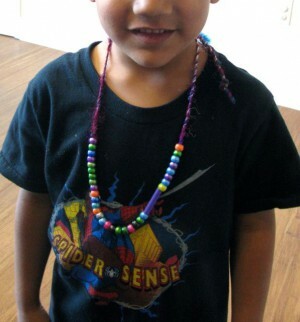 Give each child a long shoelace and their choice of pony bead colors or cut up drinking straws of different colors. 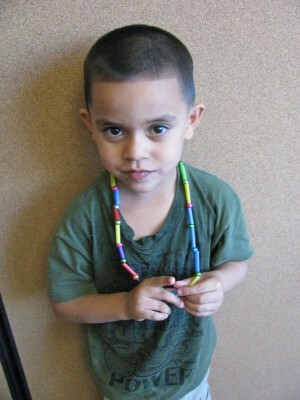 Ask them to create an interesting necklace pattern with the beads. Variation: This can also be done with Avery dots or different stamps on paper. May show no discernible pattern. May show patterns but not consistently.